Episode 1: Tokumei Sentai, Assemble! 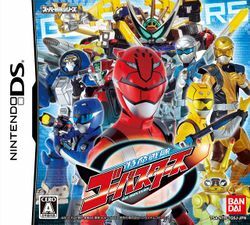 Tokumei Sentai Go-Busters is a video game for the Nintendo DS based on the TV show of the same name, itself being the 36th entry in the Super Sentai series. The Korean version, released as Power Rangers Go-Busters, was the last Nintendo DS game released in South Korea. This page was last edited on 19 January 2019, at 21:53.